Hello lovelies, how are you all doing? I recently got sent this Tea Tank, and I questioned if it was one of these gimmicky products or if it really was as good as it was hyped up to be. 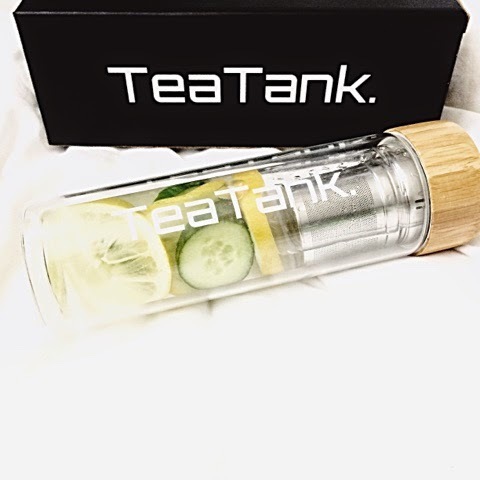 So the tea tank is specially designed to keep your drinks either really hot, or icy cold. The way that this is achieved is through the use of a double glazing system. You can see from the photo that there is a 'inner' glass, where the liquid goes, and the 'outer' glass where you hold the tank. This means that your hands will not be burned when holding the tank which is an obvious advantage. I love creating detox waters using different fruits. I have been loving lemon and cucumber water, it tastes so fresh and yummy. I also really like adding some frozen raspberries with kiwi into some water to create a more fruity flavoured water. I think this is such a great niche product and I love how easy it is to make and also is great for detoxing in a simple way. I hope you are all looking forward to the weekend as much as I am haha!! Today, I am going out for breakfast with my family and then I have accounts training at work - lucky me! The Tea Tank sounds like a great idea. I never heard of it before. I have seen products like this one and really want one! This is such a fun idea for making sure that you are drinking enough water! I really want one of these! It might encourage me to drink more throughout the day!